MORE SQUARE FEET. NO MORE STAFF. LESS BUDGET. RESIDENCE HALL Facilities directors continue to face these conditions as they work to maintain a safe and comfortable environment for their customers. Doing more with less has become standard practice on campuses of all types and sizes. Whether safety, custodial, buildings and grounds, or comfort systems, the needs increase and the means to fill them are increasingly hard-pressed. Comfort systems for heating and cooling may be out of sight, but rarely out of mind. Customer complaints for poor heating and cooling or noise in the pipes still require work orders and create added budget pressure. Time spent venting, bleeding, or cleaning dirt from a system can be better spent handling other problems. 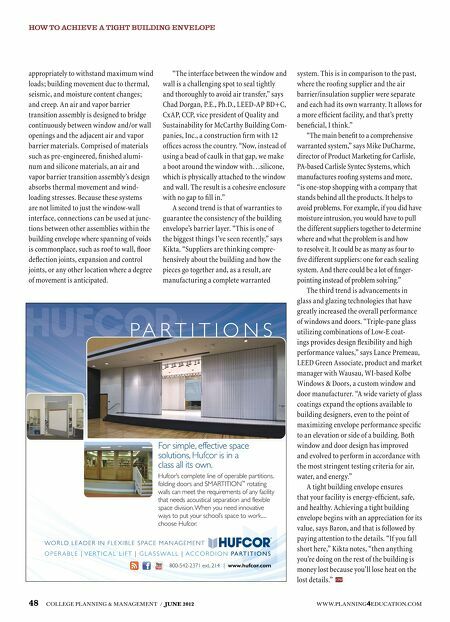 Add the cost of operating the systems and energy savings comes into play as well. 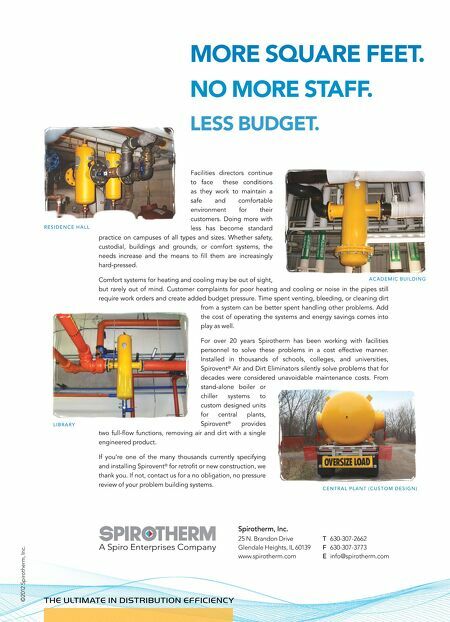 For over 20 years Spirotherm has been working with facilities personnel to solve these problems in a cost effective manner. Installed in thousands of schools, colleges, and universities, Spirovent® ACADEMIC BUILDING Air and Dirt Eliminators silently solve problems that for LIBRARY decades were considered unavoidable maintenance costs. From stand-alone boiler or chiller systems to custom designed units for central plants, Spirovent® provides two full-flow functions, removing air and dirt with a single engineered product. If you're one of the many thousands currently specifying and installing Spirovent® for retrofit or new construction, we thank you. If not, contact us for a no obligation, no pressure review of your problem building systems. CENTRAL PLANT (CUSTOM DESIGN) Spirotherm, Inc. 25 N. Brandon Drive A Spiro Enterprises Company Glendale Heights, IL 60139 www.spirotherm.com T 630-307-2662 F 630-307-3773 E info@spirotherm.com THE ULTIMATE IN DISTRIBUTION EFFICIENCY ©2012 Spirotherm, Inc.